1 - John Sepkoski Jr. suggested that marine life appeared to have its ups and downs in cycles every 26 million years. However, to Rohde and Muller, the longer cycle is strikingly more evident, although they have also seen the suggestion of even longer cycles that seem to recur every 140 million years. Sepkoski’s fossil record of marine life extends back for 540 million years to the time of the great “Cambrian Explosion,” when almost all the ancestral forms of multicellular life emerged, and Muller and Rohde built on it for their computer version. 2 - Muller has long been known as an unconventional and imaginative physicist on the Berkeley campus. Perhaps, there is an unknown “Planet X” somewhere far out beyond the solar system that’s disturbing the comets in the distant region called the Oort Cloud — where they exist by the millions — to the point that they shower the Earth and cause extinctions in regular cycles. Daniel Whitmire and John Matese of the University of Louisiana proposed that idea as a cause of major comet showers in 1985, but no one except UFO believers has ever discovered a sign of it. Let us now look at Bob Alexander's thesis and calculations which I will vary somewhat to determine the actual length of the Cosmic Year. Periodic mass extinctions appear to have happened at least several times throughout the Earth’s history. 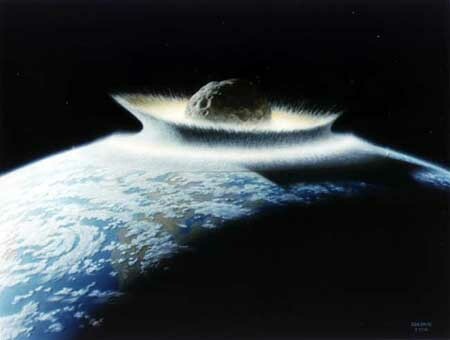 The K/T boundary, as it is called, marks the end of the reign of the dinosaurs and is about 65 Million years old. It is popularly believed that a large asteroid struck the Earth causing a worldwide change in climate, which interrupted the food chain. More recently discovered ‘Smoking Gun’ evidence points to another mass extinction, which occurred around 251 Million years ago when another large asteroid presumably struck the earth. And there appears to be even newer evidence that mass extinctions may happen at the rate of every 62 Million years (+/- 3MY). The Milky Way Galaxy is about 100,000 Light Years (LY) in diameter. Our Solar system is about 26,000 light years or about 2/3 of the way out from the galactic center and we revolve at 250 kilometers or about 150,000 miles per second. We make one revolution every 226 Million Years, which means that we have made about 20 revolutions since the Earth was formed about 4.5 Billion Years ago. It is estimated that there are between 200 and 400 BILLION other stars in the Milky Way and that at least some of those have planets. It is likely from looking at our own Solar system that at least some of those planets probably have moons. That’s a lot of stuff – not to mention asteroids and comets. Grayling, MI - 7/15/2012: I, myself, am a UFO skeptic. Pere Cheney and Grayling are next to a US Army National Guard installment, so seeing aircraft was normal...even for the middle of the night. However, these were not military aircraft. At least, none that I've ever seen before. The other two witnesses wish to remain anonymous, and wish to not be bothered about the sighting ever again. It was the last summer my friends and I had together; I was leaving to the army in September. So, we decided to have one last 'adventure' together. My parents would always tell horror stories about hauntings in Pere Cheney, and we thought we were the bravest punks around, so we decided that would be the ideal place to camp for 3 days. Once we arrived at our site- a place off in the middle of the woods not too far from the cemetery of Pere Cheney (one of the only pieces left of the abandoned settlement)- we immediately began our investigation of the area surrounding and set up camp. The first day went fine, but come the first night, strange things started happening. We woke to a flash in the sky- a very quick one. The other two went back to sleep, but out of curiosity I remained awake, fearing that a storm was coming on. To my relief, there was no thunder. I had just started to doze off when I heard some branches cracking around the tent, and I began to remember my parents horror stories about "Dogman" and Barewalk"- old Native American tales. Fearing the worst, I curled into my sleeping bag and closed my eyes. Eventually, the movement stopped. Another flash of light occurred. Sleep eventually found me, the next thing I knew I was waking up to the sun light. The next day, my other two friends seemed to have no recollection of the light, nor did they remember hearing anything moving about. Because such things seemed crazy, I wrote it off as an "all in my head" situation. We decided to explore a little that day; the previous day one of my friends had discovered a small marsh-like area. After a few moments of snooping around the area my other friend called our attention to something in the tall grass. It was a deer, but it had its throat slit as if by a surgical tool, and it had no guts. There was no blood around the carcass, and it didn't smell decomposed at all. Now unsettled, we returned to our camp to finish the second day- we spent the rest of it playing guitar around the campfire and just in general having a good time; we had forgotten all about the deer, and I had almost forgotten the light. Later that night, at about 2:30 am, I want to say, a light, cool breeze blew through the forest, and the fire dimmed to a low glow. At that moment, we got our cell phones out to check the time- and realized we didn't have signal like we had before. I raised my phone to the sky to try and find signal...and that's when I realized that some of the stars in the sky had started to fall- multiple, between 5 and 7 (I never counted them) started descending,glowing and pulsating, but still quite a ways away. I thought they were flares, but they stopped descending, and began to pulsate. At this instance we were very weary, confused, and frightened. The "stars" began to float over toward us, slowly moving directly over our heads without making a sound. Then they ascended after passing the camp for a moment- very quickly, though...not slowly, almost like they teleported. They hovered over a field not too far from the small opening we had made our camp in. The lights came closer, producing a light green aura in a circle. From the forest came three low glowing blue orbs, at that instance is when a low humming could be heard, and they came together and sat still. Then they ascended in between the "stars", which had now come together in a solid object, and they ascended even more; slowly at first, but then began to speed up, ascending at an angle. A large horned beast known as the 'Siberian unicorn' could be the origin of the modern unicorn legend. Originally thought to have died out 350,000 years ago, Elasmotherium sibiricum would have been a sight to behold - a horned behemoth standing 6ft tall and measuring up to 15ft in length. Now scientists have found new evidence to suggest that this unicorn-like creature may have actually survived until as recently as 26,000 years ago, meaning that it would have lived alongside modern humans for many thousands of years. The discovery was made after fossil fragments were unearthed in Kazakhstan where an isolated population was thought to have survived long after the species had gone extinct everywhere else. 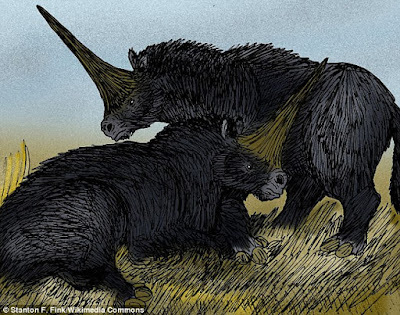 Many researchers believe that early findings of fossil Elasmotherium's may have been the origin of the mythical unicorn - a theory seemingly backed up by early palaeontologists who had heard stories from the Tatars of Siberia about a unicorn with a horn so large that it needed a sledge to move it. Whether the legends really did originate with these remarkable beasts however remains unclear, but what is known is that these were very real creatures and that, as the global climate changed, they were driven in to smaller and smaller areas until they eventually disappeared entirely.